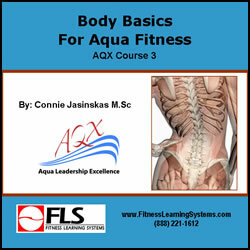 Body Basics for Aqua Fitness is designed to give you fundamental knowledge about functional anatomy, kinesiology, and physiology related to vertical aquatic training (aqua fitness). This course (AQX Course 3) explains muscle roles and priorities, key training principles, as well as physiology of vertical immersion. Over 71 videos and several interactive and printable activities. Whether you are working with sports teams, post-rehabilitation groups, aquatic personal training, or seniors' group aqua fitness, Body Basics for Aqua Fitness is fundamental to your success. Identify 17 fundamental movement terms and explain how they are used to describe basic movement. Describe 4 planes of movement and explain exercises that are performed in each movement plane. Describe 6 functions of bone, discuss the role of aqua fitness in bone health, and identify 22 bones in the human skeleton. Describe two functions of muscles and identify 24 muscles in the human body. Discuss 4 muscle pairs and explain exercises that will help to create muscle balance. Explain the role of Overload in training and discuss how to use the FITT Formula to apply proper frequency, intensity, time, and type to training programs. Explain the role of prime movers and stabilizers in exercise. Discuss the role of 4 aquatic properties in programming for aquatic exercise: buoyancy, resistance/work, turbulence, and thermal conductivity. Describe the effects of immersion on 4 body systems.